Zdob si Zdub went through some changes in its line-up. The drummer Anatolii Pugaci (the first drummer of the band; played from 1994 to 1998, then from 2004 to 2010) and the guitarist Igor Buzurniuc (that participated with Zdob si Zdub in the Eurovision 2005 and then played from 2008 to 2010) left the band. They were replaced by other former members of the band: drummer Andrei Cebotari (in the band from 2000 to 2003) and Sveatoslav Starush (Ryjik) (1996-2004). ROMAN YAGUPOV – lead vocalist: The changes in the line-up of the band occurred due to the fact that some musicians have ceased to find a common language. This happened exactly during the period when the band was already working on the new material for an album, with the German producer Marc Elsner. The relationships strained to the limit and the co-founders of the band decided to do a castling. Some of the founders were against it, but unfortunately due to the disputes there was no possibility to continue the work and move forward. The fact that musicians change in our band is not new to me, and I am already tired of this. I thought that those days are in the past, but no – I was wrong ... During the recent years, our line-up more or less stabilized, and we were playing great concerts! We were preparing to record a new album; we were thinking of the way it will sound. We were rehearsing ... Mihai was bringing new ideas and we started to develop them, there were bright and inspired rehearsals, but also complex creative jams. Such is the life of those who create something new! I don’t want to judge anybody, but the nervous atmosphere was governing and some kind of stopper developed on many fronts… like requiring contracts (for the new album), discussing the authorship etc. I think that we all lacked experience, patience and mutual understanding! And it happened what happened! Unfortunately things like this happen, but we must move forward, the band must continue to live and work! MIHAI GINCU – composer, bass guitar: Zdob si Zdub is a difficult team. For many years musicians joined and left the band, I thought about it too. Of course, the band’s growth depends on the management and our management works very well. The concerts’ geography extended more and more. Having such diverse material, the band became frequently invited to play in all CIS countries and abroad. The exhausting tours seriously undermined the relations between us. The situation with our management also became tense many times, but the show business dictated its conditions and fate threw us the most absurd suggestions and ideas. Therefore songs like “Smugleanka”, “Kostiumchik” and others appeared... Later this type of songs became the main repertoire of Zdob si Zdub and the music performed during the concerts was oriented towards the band’s commercial success. Obviously, I did not want to accept this state of affairs, because these songs were done for specials shows and ironically entwined our musical flavour. Developing the Zdob si Zdub traditions and the not disappointing our fans was impossible, especially because our managers in different countries were requesting a particular approach from the band. Roman’s and my opinions were divided. Roman saw the success of the concerts only in songs easily perceived, completely forgetting how he was jumping during the song “Zdubii bateti tare” from the album “Tabara Noastra”, on Red Square in Moscow, all in body art, naked to the waist, charging everyone with his sheer energy. Of course, opening for Red Hot Chili Peppers was a huge stimulus for all of us, but in the end Roman tried himself in other genres, plus the stock of dance and entertainment songs, the participation in “questionable” TV shows, all together completely changed the band’s image. With the return of Anatol Pugaci, and later of Igor Buzurniuc, I thought everything would change. Anatol always played in a very aggressive manner and Igorash was really interested in alternative rock. At that time I was thinking they will become my accomplices, would bring to Zdob si Zdub that rock foundation and would restore the old style, but unfortunately it never happened and this served to new circumstances. Afterwards, everyone took his own position. Meanwhile, the tumultuous concert activity didn’t afford us to take a break and look at all the questions from aside, especially because everything satisfied everybody. The management was pleased, everybody else – as well. We were not doing anything else than waking up on a plane and again waking up on a place. It can be said that we became a cover-band, playing music for the public. Frankly, the music that made us famous was ignored and under Roman’s influence a playlist of songs that were comfortable for him was created, although our tour experience, including abroad, proved the opposite regarding the public’s preferences. Soon the negotiations with the producer from Berlin, Mark Elsner, began. I think everyone differently understood the future success ... the first demo recordings were done. Everything went pretty well, but after testing the tracks in Europe, the producer said that the material is not competitive, but I definitely didn’t want to return to the entertainment genre and together with Roman and Igor Dinga we decided to break up the band, in order to better understand what to do further. I don’t want to offend anyone, because all the members of our marathon - Zdob si Zdub, are very talented people ... We were affected by this “divorce”, but this time Roman was mostly affected. He was accustomed wit the fact that in the old line-up the music box was working like a clock... without refusals... All concerts were identical and Roman stopped working on himself ... his ability to surprise people simply disappeared. Also, all sorts of TV shows distracted him. Zdob si Zdub has great potential and a catalogue of recordings involving different musicians. I found common language with some, but unfortunately with others - no. From now on I think everything will change in the better direction. We are signing a creative contract among ourselves, under which each will know his responsibilities and opportunities and in future it will help us to avoid situations of conflict. In the contract it will be designated the period of cooperation among us and on the contract’s expiration we will understand how to treat each other ... to continue the work together or not. I regret that we didn’t have this idea earlier and therefore many talented musicians suffered. We, the co-founders of the band, decided to break up, and then we had a meeting and announced everybody. The conflict started, but we continued to tour together, since the concert schedule was established for several months ahead and we couldn’t cancel it. Being on stage, we forgot about the conflict and made a good job. Thus we started to respect each other even more. We understood that it makes no sense to continue. When Andrei Cebotari and Ryjik returned to the band, I found in them the co-workers and friends with whom I feel in harmony. Perhaps many critics would say that this line-up hasn’t yet learned to play, but instead there is the desire to learn. Dedicated to all musicians. Thank God! Good luck to everyone! IGOR DINGA - Director: The changes in the Zdob si Zdub line-up are not radical; the replacements didn’t affect the performance and the music. The new musicians play the same songs and the audience won’t really notice the change. But the band needed an update, the moral factor was worse than ever; some musicians weren’t communicated among themselves and were coming out on stage performing mechanically. This renewal refers only to the human factor, not the artistic one! The band didn’t release a new album for already six years, except the compilation Ethnomecanica, which was released in 2006, mainly for the European market, and I couldn’t allow our plans regarding the new album to fail. Late 2009, when the work on the new album was in full swing, the disagreements among musicians appeared, each of them had his own attitude towards his participation in the writing of the album, and when ambitions have reached the limit, it was decided to make some changes. In the beginning I was worried that our German producer will not be able to work with the other musicians, but after the second creative meeting from February 2010, I understood that both Cebotari and Ryjik are doing quite well, and we scheduled for April 2010 the first studio recording session in Berlin. 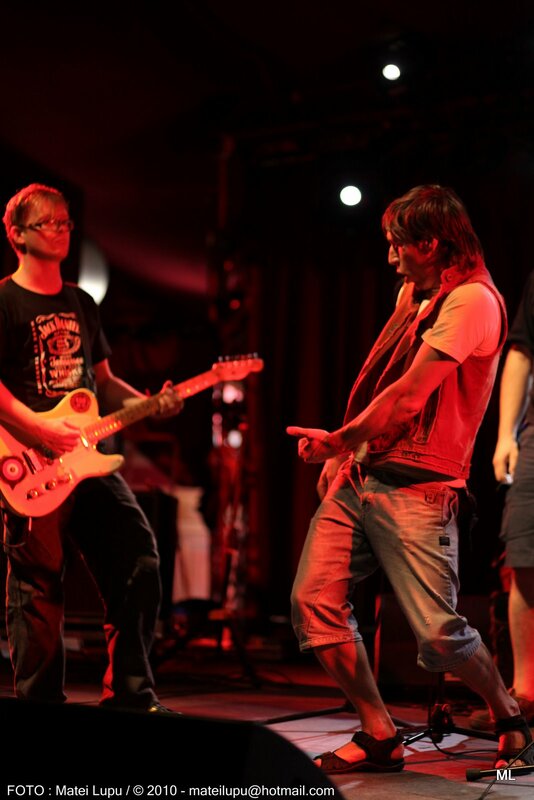 The first concert in the new-old line-up took place in Austria in June 2010. Of course, the first shows were much weaker and were accompanied by some emotion, but for two months the band performed over 20 concerts, which is more than for the last half of the year. Zdob si Zdub have considerably improved and on July 30 they gave a brilliant concert in Paris! I wouldn’t say that changing the composition solved all the issues within the band. Creative differences between the Roman and Mihai remain. But meanwhile, working with a professional producer has joined the main characters of Zdob si Zdub for procreation. IGOR BUZURNIUC – guitarist: Firstly I would like to say that I am very sorry that things got here! I spent several beautiful years in Zdob si Zdub and I’m left with many impressions! Unfortunately Zdob si Zdub lives in Moldova and, I believe, it is contaminated by its social and political situation and lifestyle and the band successfully implements these in its daily life! Democracy and transparency unfortunately are missing in Zdob si Zdub, the game they play satisfies only some of the members and unfortunately they are spitting on friendship, comradeship and respect! Money and the interests of some are above those mentioned! F**K THAT! Star egos, hmmm, feel as home in Zdob si Zdub! Thanks to the Fans for the wonderful moments we created together during the concerts - these are the most valuable impressions that I will keep with love! Thanks Roman, Valerica, Vitea, Anatolii, Ion for the beautiful moments on the stage! Not to forget about the Management team, Thanks! ANATOLII PUGACI – drummer: Hi everybody! At the beginning I wanted to write a lot, then I decided not to present the full cause of the band’s discord. As the saying goes – quarrels should not be taken out of the house. There is one thing I want to say: thank you to everyone who has been with me along the creative path. I think Roman, Valeriu Victor, Igor, Mihai and Anatol form the most elaborated line-up in the history of Zdob si Zdub. They could’ve not destroy the band, but create a new project. It is my opinion. There weren’t given details on my leave from my native band. Let it remain on the conscience of those who took this decision. Time will put all in place. SVYATOSLAV STARUSH – guitarist: When a band goes through periodic changes in its line-up, it means that the constant conflicts and contradictions are eating the group from the inside. For Zdob si Zdub this has been always true, but there is nothing surprising, because the band itself is formed of very different people, each of them with a personal life style, with his own opinions, ambitions, someone loves the art from himself, another loves himself in art etc. From these start all the contradictions and misunderstandings – it is not easy when you are together for so many years. This had never been exposed in public and I think it should be like that, largely because it’s nobody’s business. I became a part of ZsZ long time ago, I never considered myself a session musician and generally I have devoted a significant part of myself to the band. There were different times, people come and go, all for different reasons, and when there were more disappointments than beautiful moments I started to move away, too. And if there is no understanding in what is most important (i.e. creative work), the tension begins to increase, this leads to personal conflicts, which, in turn, lead to breakup. I don’t want to talk anymore about the past. Now for me the most important thing is that I’m back in the band, I feel great, the creative process is ongoing; also, writing music with Mihai is always interesting. I’m also very pleased that Andrei is with us, a goal-oriented person, but also incredibly relaxed and calm. We will release a new album, 100% ZsZ songs; the recording process itself was an adventure for all of us. The controversies of the past remain in the past and as long as the band will write new song, will create shamanism on stage, which means to live, all personal small disputes and conflicts will go on the background and will generally appear less often. ANDREI CEBOTARI – Drummer: I left Zdob si Zdub on family grounds in 2003. 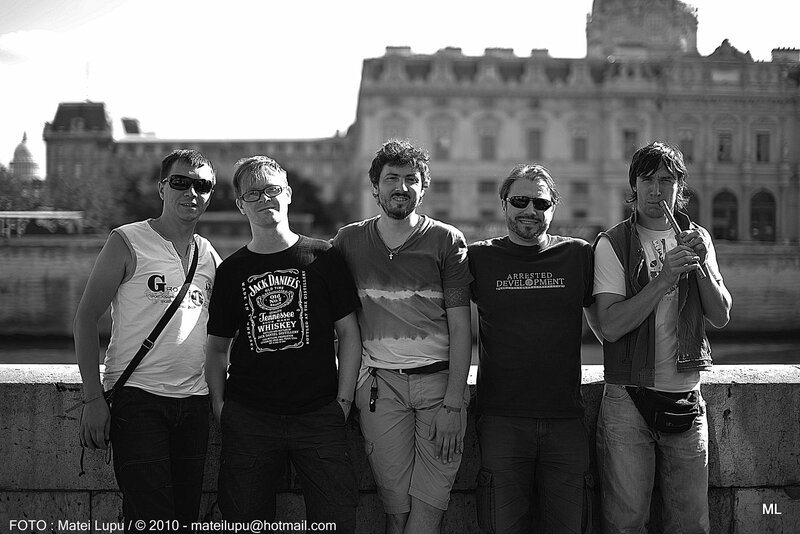 Afterwards, I played in Romania with the band Bosquito, in the 2004-2006 period. We recorded an album and toured Romania. In 2006 the Bosquito’s lead vocal and I moved to USA. There we formed a band named Madame Hooligan. Together with our fellow American musicians we went touring California, Illinois, and Michigan. Unfortunately we didn’t achieve much and since music wasn’t ensuring an income in Los Angeles, I had to work as a truck drive.Together, with my singer, Radu, we went to Rick Rubin, just to take some advices, we colaborated with musicians from P.O.D, Korn, Limp Bizkit and others. One day I got a letter from Igor Dinga about participating in the recording of some tracks for a new project. The band decided to record some songs that I once played with them, but we never recorded them. In September 2009 Igor Dinga came for business to California and he visited me in Los Angeles. Together we visited Valeriu Gaina and we discussed a lot about the artistic activity and the fate of the musicians that left their home country and moved to USA. I came back to Moldova in winter 2010. I haven’t been here for 3 years. I met with the guys and we started the recordings for the Russian album. I didn’t really know what was happening in the band. Everything somehow was solved and I was invited to participate in the recordings of the new album. After some rehearsals we went to Berlin! 7 years since I haven’t played in Zdob si Zdub and here I’m back again! Now that we have told you all these, we would like to apologize, our dear friends, that we didn’t inform you earlier about what was happening in the band, but please give us some understanding, it was a period of uncertainty and debate both among us and within each of us. Also please don’t judge us to harsh, we are all humans. We wanted to be sincere with you and we hope you appreciate this. Now we think that the situation is settled and we do our best to continue efficiently out creative activity. Soon we will be back with detailed information about the releases that have been mentioned here and there. Bon Voyage - Paris, I Love You! Airplanes, Chisinau-Munich, Munich-Paris, and here we are for the first time in France, Charles de Gaulle airport. After driving through the outskirts of Paris, which reminded us of Bucharest, we left our luggage in the hotel and went to dine with our compatriots who have moved to France long time ago and opened a restaurant 300 meters from the Eiffel Tower. Monsieur Vitaly greeted us with a jug of wine, oysters and dumplings. On the way to the restaurant we passed the most famous streets of Paris, we saw the renowned Tower, the Champs-?lys?es and the city's interesting people walking along the river Siena. Late at night, singing "Bun ii vinu Ghiuguliu" we went to bed. On the next day we went to do the rehearsals in the retro-cabaret that has the shape of a circus – a whole complex of terraces, called Cabaret SAUVAGE! A great place for any festival! Special thanks to Romanian Cultural Institute for inviting us to Sin Fronteras Festival. Also, many thanks to each employee of the Institute, that accompanied us and gave us support during out stay in Paris! The Festival program for our day, July 30: Concert ZDOB SI ZDUB + FAREN KHAN + DJ TAGAD + selling art objects and souvenirs + Romanian and Moldovan kitchen. Moreover, photographers’ and artists’ performances and activities for children could be attended. Rehearsals went great, there were three hours remaining until the show and we took the subway to go for a walk in the city center. We were accompanied by the photographer and press attach? of the Romanian Embassy in Paris. We got into the dizzy atmosphere created by mass entertainment, cafes, the smell of perfume and freshly prepared dishes and people eating baguettes in the street. And here's the famous Saint-Germain, Bastille and Notre Dame. We felt unusual that everyone around spoke French and during the dinner we realized that the French do not speak English - learning foreign languages should start at the kitchen! To our amazement, on this day of summer, when vacation season is in full swing, many people gathered in the concert hall. There were present two large diasporas, the ones of Romania and Moldova, and of course their French friends. Most came with their children and everyone sang along, danced and had fun. We could read a lot of emotions on the happy faces of our fellow citizens, some were weeping with joy. Many of them haven’t visited Moldova for 6-10 years, as they are still living illegally in France and thus cannot leave it and then return. Our concert was a real feast for them: by means of music, you can return to the roots and feel yourself! The new Moldovan Ambassador in Paris, Mr Serebrean, was present at the concert, but he sat modestly in the lodge and drank mineral water. Our flags fluttered throughout the hall, the audience was in ecstasy, it was a very successful concert: we came out for 3 encores and sang for around 2 hours. So far, it is probably the best concert of this year! After the Zdubs, DJ Taganda followed; the audience was patiently waiting for autographs and to take pictures with the band musicians. Many invited us to continue the feasts, they were eager to spend the night with us, but on the next day we had to wake up early, we had a flight to Berlin at 9 AM. Saturday morning, 7:00, the streets are empty, we headed to the airport. In Paris there are surprisingly many traffic lights that are not off during the night. The city’s neighborhoods are built irregular with traffic lights at every corner ... they do not allow us to move quickly. Romanian Cultural Institute minibus driver is nervous, with uncensored speech he goes on red. We were ready for a police chase, but fate spared us and we managed to arrive on time. Paris, we love you! Thanks to everyone that made our concert there possible! P.S. : More photos in the Media Section.